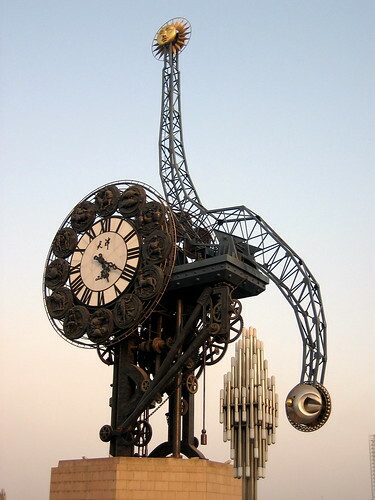 This beautiful and strange looking clock known as the "Century Clock" is located on a round about at the banks of Haihe River near the Tianjin Railway Station, China. 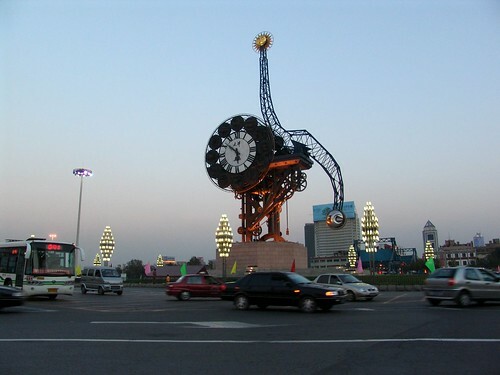 Built in year 2000, the three dimensional art work is mounted on 8 metres long, 2.8 metres high granite pedestal. The bell is 40 meters high and its face has a diameter of 14.6 meters. Besides roman numerals it also displays the 12 zodiac signs on its face. Its 'S' shaped pendulum which swings up and down has shinning Sun on one arm. I am not sure what the other arm signifies. The bell is provided with GPS receiver to maintain accuracy of time.